The Lakers took advantage of a short-handed Grizzlies team on Sunday at Staples Center, defeating Memphis 108-103. D’Angelo Russell scored 28 points, and Larry Nance Jr, Julius Randle, and Thomas Robinson all put up double-doubles, as the Lakers snapped a four-game losing streak. The Grizzlies played without Marc Gasol and Vince Carter. The Lakers took advantage but lost some ground in the lottery standings. Phoenix lost against Houston, so LA now has the 3rd worst record in the NBA. If the Lakers 1st round pick this year lands outside of the top 3, then that pick goes to Philadelphia, as part of the Steve Nash trade. The Lakers were clinging to a 1 point lead at halftime, and trailed by 1 heading into the 4th quarter, despite allowing the Grizzlies to shoot 60% in the 3rd quarter. The game was tied at 90-90 with 5:44 left, and then again at 97-97, but the Lakers came through in the 4th quarter. Randle iced the game with two free throws in the final five seconds. The Lakers will now travel to San Antonio to take on the Spurs on Wednesday. The Clippers continued their dominance of the Lakers on Sunday at Staples Center, defeating the Lakers 115-104. Blake Griffin scored 36 points, Chris Paul poured in 29, while Doc Rivers earned the 800th victory of his career. J.J. Redick contributed 19 points for the Clips as well, who are now 1 game behind the Jazz for 4th place in the Western Conference. Since 2012-2013, the Clippers have won 18 of the last 20 meetings between the Staples Center co-tenants. It’s also the 5th straight year that the Clippers have won the season series with the Lakers. David Nwaba led the Lakers with 19 points off the bench, while Brandon Ingram scored 10 of his 18 points in the 4th quarter. Thomas Robinson added 16. The Clips started quickly in this one, jumping out to a 17-0 lead before the Lakers would answer. A Robinson basket broke a string of 11 consecutive misses for the Lakers. Robinson held his own against Blake Griffin and DeAndre Jordan, and his early efforts actually brought the Lakers to within 28-22 after the 1st quarter. The Lakers took a brief lead in the 2nd quarter, but the Clippers would take control again by halftime, leading 55-50. Paul had scored 11 points and dished out 7 assists at that point. The 3rd quarter however, saw the Clippers up by as many as 22 points, and after being outscored 38-22 in the period, the Lakers trailed 93-72 entering the 4th quarter. The Lakers got within 8 points in the 4th quarter behind a strong effort from Ingram. Much of that was the result of the Clippers bench giving up that lead, which has been a common occurrence this season. However, Paul and Griffin scored the Clippers last seven points to secure the victory. 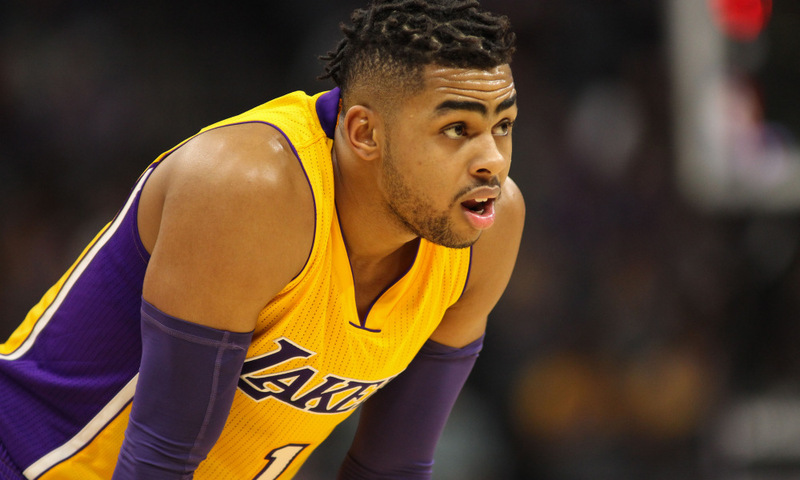 It was a rough game for D’Angelo Russell, who had just 2 points on 1-9 shooting. Jordan Clarkson didn’t fare much better with 7 points on 3-12 shooting. The Lakers have lost 18 of their last 20 games, and will now take on the Grizzlies on Sunday afternoon at Staples Center. Meanwhile, the Clippers are off until Wednesday, when they host the Mavs at Staples. Ricky Rubio scored a career-high 33 points to go along with 10 assists and 5 rebounds, as the Timberwolves pulled away from the Lakers in the 2nd half and won 119-104, on Thursday night at the Target Center. The Wolves also got 32 points from Karl-Anthony Towns, and 27 points from Andrew Wiggins. The win was the 30th of the season for Minnesota, which is one more than they had all of last season. As for the Lakers, Jordan Clarkson led the way with 18 points, while D’Angelo Russell scored 14 and dished out 6 assists. However, Brandon Ingram sat out his 3rd consecutive game with patellar tendinitis in his right knee, and the Lakers lost for the 17th time in the last 19 games. Neither team played a whole lot of defense in this one, with each side putting up 37 points in the 1st quarter. The Lakers had a 4 point lead at one point in the 2nd quarter, but the Wolves had a 67-60 lead at the half. The Wolves had a big 3rd quarter, and took a 14 point lead into the 4th quarter. The Lakers tried to rally, and got within 9 points with 4 minutes left. However, Rubio would convert a drive to the basket, and then make a 21-foot jump shot to regain the momentum for Minnesota. The Lakers also got bad news when center Ivica Zubac sprained his right ankle two minutes into the game. 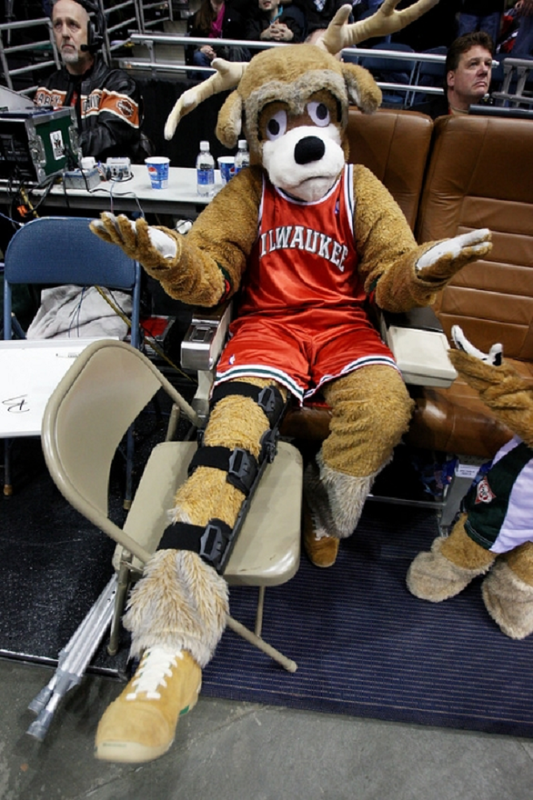 He left the arena in a walking boot, and will be re-evaluated when the team returns to Los Angeles. Up next for the Lakers, they’ll return home to play the Clippers on Saturday at Staples. It will be a designated home game for the Clippers. John Wall scored 34 points while dishing out 14 assists, as the Wizards had a huge 4th quarter rally to defeat the Lakers 119-108 at Staples Center on Tuesday. The Lakers led by as many as 16 in the 3rd quarter, and 13 heading into the 4th quarter. However, Washington outscored LA 37-13 in the 4th. “We just missed some early shots and turned it over and it snowballed from there,” Laker coach Luke Walton said. The Lakers fell behind early in this one. They trailed by 12 halfway through the 1st quarter, but an 8-0 run capped by a David Nwaba layup tied the game after the 1st quarter. By halftime, the Lakers had built a 3 point lead. A 14-3 run starting with 9:23 left in the third quarter gave the Lakers their first double-digit lead of the game. The Lakers didn’t score for the first 2:05 of the 4th quarter. Washington scored nine straight points to cut into the LA lead. Late in the 4th, Wall stole the ball from Russell, then dunked it at the other end of the floor to tie the game at 101-101. That changed the momentum that the Lakers couldn’t recover from. The Suns lost on Tuesday night as well. That means the Lakers remained .5 games behind Phoenix in the Standings. The Laker ownership controversy has ended peacefully. Jeanie Buss has removed her brother Jim Buss as a trustee and replaced him with her younger sister Janie Buss, according to documents entered into Los Angeles Superior Court on Monday morning. The three siblings have agreed for Jeanie to serve as controlling owner and on the team’s board of directors as long as the family owns the Lakers. Johnny Buss will remain on the board of directors. “It’s great that we were able to work this out so fast. We’ve resolved everything clearly and cleanly and now we can get back to work,” Jeanie Buss told ESPN. According to sources close to the situation, neither brother was given any additional financial settlement beyond what’d they’d be entitled to through yearly salaries and disbursements from the trust. “Jeanie is captain of the ship,” Janie Buss told ESPN. “My sister is the one who finally played her aces. I’m just behind her. I’ve always been behind her. Now she can focus on where the Lakers need to go. The agreement means the probate court trial scheduled for May 15 to resolve the matter won’t happen. The Blazers pulled away from the Lakers in the 3rd quarter on Sunday night at Staples Center, defeating LA 97-81. Damian Lillard scored 22 points to go along with 7 rebounds and 5 assists, while Noah Vonleh grabbed a career-high 14 rebounds. The Blazers outscored the Lakers 37-24 in the 3rd quarter. The Lakers trailed by 8 points in the 3rd quarter when the Blazers blew open the game with a barrage of 3-pointers. Portland went on a 16-3 run, which included four 3-pointers. That gave them a 21-point lead. D’Angelo Russell led the Lakers with 22 points and had two assists. Reserve point guard Tyler Ennis added 14 points. LA played without rookie Brandon Ingram, who sat out with patellar tendinitis in his right knee that had been bothering him since Thursday’s practice. Allen Crabbe scored 18 points off the bench for the Blazers, who tied the Denver Nuggets for the 8th and final playoff spot in the Western Conference. The Lakers, who won their previous game against the Timberwolves, have won consecutive games only once since mid-November. Up next for LA, they’ll face the Wizards on Tuesday night at Staples Center. The Lakers snapped a 6-game losing skid on Friday night at Staples, beating the Timberwolves in overtime 130-119. Jordan Clarkson scored a career-high 35 points, while making eight 3-pointers. Clarkson rebounded from a poor shooting night against the Clippers, a few days earlier. Julius Randle added 23 points and 12 rebounds for the Lakers, who won for only the 2nd time since the All-Star break. Andrew Wiggins scored 36 points for Minnesota, but fouled out with 1:17 left in overtime. Karl-Anthony Towns had 25 points and 13 rebounds, as the Timberwolves lost their 5th in a row. The Lakers went on a 9-1 run with 2:30 left in the game, which erased an 8-point Timberwolves lead. Randle’s bank shot finished the run, but Wiggins made one of two free throws to send the game to overtime. Clarkson took over from there, scoring 7 of 8 straight Laker points. That gave the Lakers a 117-109 lead. Minnesota would never recover, despite Ricky Rubio’s best efforts. He finished with 19 points and 15 assists for the Wolves. 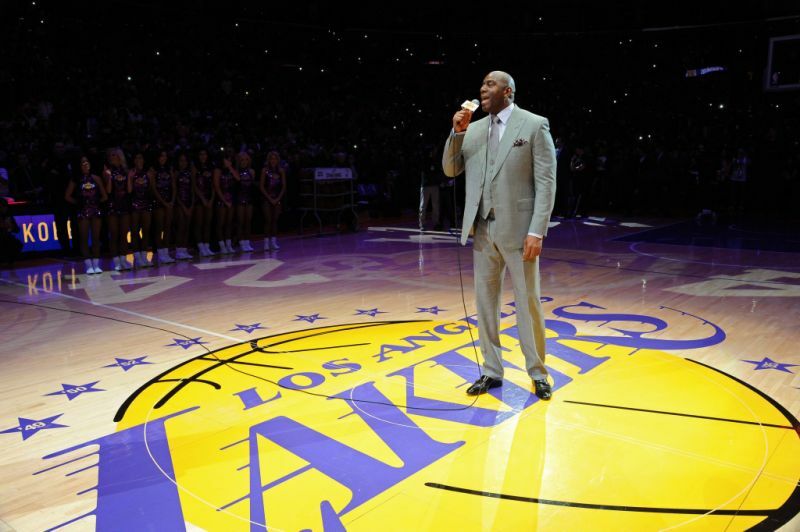 Before the game, the Lakers unveiled a statue of Shaquille O’Neal in Star Plaza. O’Neal sat courtside with mother Lucille O’Neal and they shared a kiss. O’Neal addressed the fans at halftime as well. The win along with the Suns loss, means the Lakers are only 1 game worse than Phoenix in the battle for better lottery odds. The Lakers only keep their 1st round pick this year if lands in the top 3, and they currently have the 2nd worst record in the league. LA returns to action on Sunday against Portland at Staples Center. The Lakers were the designated home team in their showdown with the Clippers on Tuesday, but it wasn’t much of a contest, with the Clips winning 133-109. Chris Paul led the way for the Clippers with 27 points and 8 assists, J.J. Redick had 24, and Austin Rivers scored 18 off the bench in a game that was virtually decided by halftime. The Clips were up 70-40 at the half. Although the Lakers didn’t play much defense, they did get some productive performances from their young players. Brandon Ingram scored 21 points and D’Angelo Russell had 18. Ivica Zubac had 17 and 7 rebounds, while Julius Randle added 19. The Clippers shot 53% from the field and outscored the Lakers in the paint 60-36. They got whatever shot they wanted, and the Lakers couldn’t do anything about it. The Clippers also hit 3-pointers. For the 2nd straight game, the Clippers starters sat out the entire 4th quarter. The game was so out of hand that Chris Paul was watching the 4th quarter with his son on the bench. The Clippers have now defeated the Lakers in 17 of their last 19 meetings. The win moved them a little bit closer to Utah, who is now just .5 games ahead of them for 4th place in the West. The Lakers on the other hand picked up their 51st loss of the year. With Phoenix’s loss to Miami, the Lakers remain two games worse than the Suns for the 2nd worst record in the league, and the race for better lottery odds. D’Angelo Russell scored a career-high 40 points, but he was out done by Kyrie Irving’s 46 points, as the Cavaliers beat the Lakers 125-120. The Cavaliers rested Lebron James, Kyrie Irving, and Kevin Love on Saturday against the Clippers. It turns out they needed all that rest to beat the Lakers on Sunday. Irving led all scorers with 46 points. LeBron James had 34 with seven assists and six rebounds, and Kevin Love scored 21 points for Cleveland. The Lakers actually led by as many as 11 points in the fourth quarter before Cleveland came back. After a Lebron James layup with just over five minutes left, the score was tied at 104-104. The Cavs took control from there. Jordan Clarkson added 19 points for the Lakers, and rookie Brandon Ingram had 18. All five Lakers starters scored in double figures for the first time since Christmas. 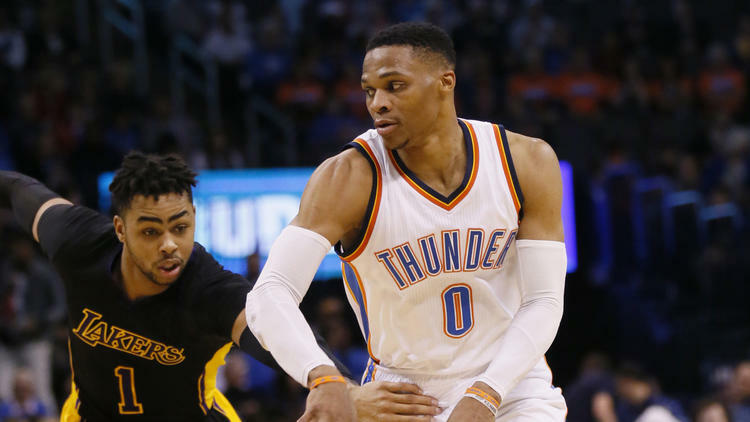 Russell also had six assists, two steals and only one turnover. He became the youngest player since James did it in 2004 to score 40 points, with six assists and one or no turnovers. He also got some praise from his competition when it was over. The Lakers have been experimenting with different lineups the last week to better evaluate their young talent. Russell had been coming off the bench for a few games before returning to the starting lineup on Sunday. There’s also been some talk about whether or not he’s really a shooting guard or a point guard. “I’m a basketball player,” he said, “not a point guard or a shooting guard.” Russell looked like a very promising one on Sunday. The Lakers return to action on Tuesday night against the Clippers. It will be a designated home game for the Clippers. The Lakers and Bucks engaged in a typical NBA style fight which led to a series of ejections in Milwaukee’s 107-103 victory over LA at Staples Center on Friday. Khris Middleton scored 14 of his 30 points in the 4th quarter, to help get the Bucks their 8th win in the last 9 games. However, the story of the game was ejections. Malcolm Brogdon fouled Nick Young hard with 36 seconds left in the 3rd quarter, which prompted Young to shove him back. Greg Monroe shoved young, and then D’Angelo Russell and Brandon Ingram came to Young’s defense, shoving back, and so did a Bucks security guard. Young scored 16 points and Russell had 14 before their ejections, but the Bucks appeared to be cruising to an easy win before the prolonged scuffle. They had opened up an 18-point lead while Giannis Antetokounmpo scored 12 points in the first 6:15 of the third. “The Greek Freak” finished with 26 points before fouling out. The Lakers were led by Jordan Clarkson’s 21 points. They maintained their 2 game “advantage” over Phoenix for the 2nd worst record in the league. Milwaukee leads eighth-place Miami (34-35) by a half-game, and the Bucks opened up a 1 1/2-game lead over the ninth-place Detroit Pistons (33-36), who lost to Toronto. The Lakers return to action on Sunday against the Cavs at Staples Center. The Lakers are taking this whole tanking thing to a new level. This time they lost to Houston 139-100 on Wednesday in Texas. It was their 2nd 39-point loss to the Rockets this season. James Harden had 18 points, 13 assists, and 12 rebounds for Houston, and Lou Williams scored 30 points against his former team. The Lakers lost for the 11th time in 12 games. Julius Randle had a career-high 32 points, to go along with eight rebounds and two assists. Brandon Ingram scored 18 points, and Jordan Clarkson also scored 18. Clarkson again started in place of D’Angelo Russell at point guard. He added two steals, three assists and three turnovers. It was a rough night for Russell, who is adjusting to his new role. He fouled out for the first time in his career after playing 25 minute. He made two of 10 shots, missing all five of his three-point attempts. He finished with five points and committed seven turnovers. The Lakers still have the 2nd worst record in the league with 14 games left, and they are two games worse than the 3rd worst Phoenix Suns. That’s important to watch because the Lakers only keep their 1st round pick if it ends up in the top 3. The Lakers will return home on Friday to take on the Bucks at Staples Center. The Lakers shuffled their starting lineup on Monday against the Nuggets, but it didn’t matter. Denver dominated LA 129-101, despite moving D’Angelo Russell to the bench and starting Jordan Clarkson in his place. Will Barton and Jamal Murray scored 22 points apiece. Danilo Gallinari and Nikola Jokic each added 18 points for the Nuggets, who now have a 2 game lead over Portland for the final playoff spot in the West with 15 games remaining. Ivica Zubac was the lone bright spot for LA, scoring a career-high 25 points to go along with 11 rebounds. Jordan Clakrson had 19, and Brandon Ingram scored 14, as the Lakers lost for the 10th time in the last 11 games. Russell scored 10 points and had 3 assist on 4-14 shooting in 27 minutes. However, Walton said the move was made more for evaluation purposes. “D’Angelo has been playing great when you look at his numbers, but we’re 1-7 after the break and I want to see some other looks,” coach Luke Walton said before the game. The Lakers trailed by as many as 32 points early on in the 3rd quarter. They managed to cut the lead to 93-76 after 3 quarters, but couldn’t get much closer. However, Denver went on an 11-0 run in the 4th to build a 28 point lead. With 15 games left, the Lakers have the 2nd worst record in the league. They’ll take on the Rockets on Wednesday in Houston. “We’re gonna continue to look for opportunities to look at new things so we can gain as much information as possible going into the off-season,” Walton said. The Lakers lost to the 76ers on Sunday night at Staples Center, 118-116, in a game between two lottery bound teams. Jordan Clarkson had a career-best 30 points and helped the Lakers rally from a 12-point deficit late in the game, but it wasn’t enough. Dario Saric scored a career-high 29 points for Philadelphia, and Jahlil Okafor added 23. T.J. McConnell’s hit a 12-foot fallaway jumper with just under a minute left, and the 76ers never gave up the lead from there. Tomothe Luwawu-Cabarrot scored 18 points for the 76ers, and Julius Randle put up 21 points and 12 rebounds for the Lakers. The Lakers trailed by as many as 11 points in the first half, but used an 8-2 to tie the game at 65 by halftime. Their execution late in the game though was problematic. D’Angelo Russell airballed a last minute 3-point try, and looked to be confused about the time remaining on the shot clock. Randle fouled Gerald Henderson after he was double teamed and looked to be in trouble, and Clarkson missed a key free throw in the final seconds. The good news for the Lakers was that the game helped them in the lottery standings. The 76ers receive the Lakers 1st round pick if it falls out of the top 3 in this years draft. The Lakers remained with the 2nd worst record in the NBA after Sunday’s loss. The Lakers beat the Phoenix Suns on Thursday night, but it’s debatable whether or not the 122- 110 win on the road was a good thing. Both the Lakers and Suns are in contention for the 2nd and 3rd worst records in this summer’s NBA draft, which gives both teams a high probability of getting a top 3 pick in the 2017 draft. That’s imperative for the Lakers, who only keep their pick this year if it lands in the top 3. After beating the Suns, the Lakers are now just 1 game worse than Phoenix in the standings. If the Lakers finish with the 2nd worst record, they have a 56% chance of keeping this years draft pick. However, if they finish 3rd, their chances fall to 46%. D’Angelo Russell continued his scoring tear on Thursday night, scoring 28 points, which included six 3-pointers. 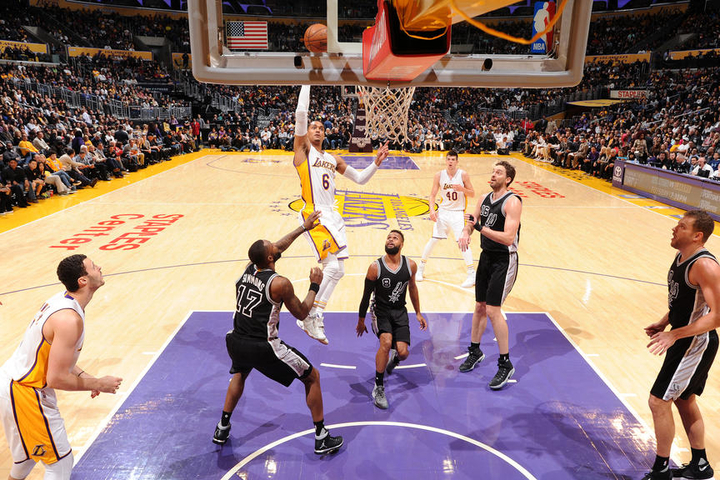 Jordan Clarkson also added 19 points, as the Lakers snapped an 8-game losing streak. The last time the Lakers played in Phoenix was on February 15th, when they lost by 36 points. That was the most one-sided Suns win in the history of the Suns-Lakers matchups. Phoenix was led by Devin Booker’s 23 points, along with 18 from Marquese Chriss, and 17 from T.J. Warren. The Lakers will play another team in the lottery on Sunday night…..the Philadelphia 76ers. Interestingly enough, if the Lakers pick doesn’t land in the top 3, it goes to Philadelphia. The Lakers went into Dallas on Tuesday night, and witnessed Dirk Nowitzki score his 30,000th career point against them, while also losing to the Mavs 122-111. Nowitzki became the 6th player in NBA history, and the first international one to reach the milestone. He joins Karl Malone and Kobe Bryant as the only other players to score 30,000 for one team. The other four players to reach the 30,000 point club are Kareem Abdul-Jabbar, Wilt Chamberlain, Michael Jordan. The 7-foot German scored 25 points for the game, to go along with 11 rebounds. He also matched the best 1st quarter of his career with 18 points, and reached the milestone at the 10:58 mark of the 2nd quarter. It came on his trademark fadeaway jumper over Larry Nance Jr.
Nowitzki hit a 3-pointer a few minutes later and the Lakers called timeout. He was congratulated by teammates at that point, and given a loud ovation by the crowd. After that he waived to the crowd in appreciation. As for the rest of the game, the Mavericks built a 31-point lead in the 3rd quarter. The Lakers fought back in the 4th quarter, but it wasn’t too late. They did however, get some good numbers from some young players. D’Angelo Russell scored 22 points on 8-17 shooting, to go along with 4 assists and 4 steals. Julius Randle had a triple-double with 13 points, 10 assists, and 18 rebounds. Jordan Clarkson had 22 points, and Brandon Ingram had 13. The numbers at the end of the game didn’t look so bad, but the reality of it is the Lakers were dominated for 3 quarters. LA has lost 8 in a row, and are still 2 game behind the Phoenix Suns, in the race to secure more ping pong balls in the draft lottery. The Lakers will be in Phoenix to take on the Suns on Thursday. The Lakers had their hands full on Sunday night against the Pelicans new dynamic duo. New Orleans held on late for a 105-97 win at Staples Center, behind the strength of DeMarcus Cousins and Anthony Davis. Cousins piled up 26 points and 15 rebounds, and Anthony Davis added 31 points and 9 rebounds, which ultimately sent the Lakers to their 7th straight loss. Nick Young led LA with 19 points, while D’Angelo Russell and Brandon Ingram each scored 16. The Lakers were down by 14 points with just over 5:30 left in the game, and then they went on a 14-0 run. Julius Randle made two free throws with 1:55 left, but the Lakeres wouldn’t come any closer than that. Anthony Davis made a jumper on the next possession. After D’Angelo Russell missed a 3-point jumper, the Pelicans would extend the lead further. Jrue Holiday made a 3-pointer to put the game out of reach, which came after New Orleans picked up an offensive rebound from Holiday’s jumper just moments earlier. The good news for the Lakers is that they are now two games behind the Phoenix Suns, comfortably giving them the 2nd worst record in the league. That’s good news because the Lakers 1st round draft pick this year is top 3 protected. The Lakers hit the road for a couple of games now. They’ll face Dallas on Tuesday, followed by the Suns on Thursday, in another game that has big implications for draft positioning. The Celtics came in to Staples Center on Friday and beat the Lakers 115-95. It was the Lakers 6th straight loss, but the real chaos that ensued was with LA’s ownership. On Friday afternoon it was revealed that Jim Buss and his brother Johnny, attempted to oust their sister, Jeanie Buss as controlling owner of the Lakers. It was just a couple of weeks ago that Jeanie fired Jim from the head of basketball operations. However, Jeanie thwarted her brothers attempts to take over the franchise. The Buss boys had attempted to call an emergency meeting next week to have a new board of directors put into place, and ultimately, remove Jeanie as the controlling owner. However, according to the Buss family trust, it is set up to have Jeanie maintain controlling ownership. Jim and Johnny have no legal leg to stand on according to Jeanie’s attorney. On the court, the Lakers weren’t very competitive against their hated rivals. Isaiah Thomas scored 18 point and Jae Crowder added 14 for Boston. The Celtics scored 70 points in the 1st half, and opened up a 25 point lead at halftime. Jordan Clarkson led the Lakers with 20 points off the bench, and D’Angelo Russell scored 17, but the Lakers fell to last place in the Western Conference. “As we were playing hard and competing, they kept inching that lead out more and more, and then it felt like we got in desperation mode, which is the thing we need to learn from tonight,” Lakers Coach Luke Walton said. The Lakers will try to snap their skid on Sunday against the New Orleans Pelicans at Staples Center. The drama with ownership may not be over though. The Lakers gave a much better effort against Charlotte on Tuesday night Staples, but they failed to make plays late as the Hornets beat LA 109-104. Kemba Walker scored 30 points for the Hornets, including a clutch 3-pointer in the last two minutes to give Charlotte the lead for good. The Hornets also got 24 points and 12 rebounds from Frank Kaminsky. Laker Coach Luke Walton was very disappointed in his teams effort on Sunday against San Antonio, but got a much better effort on Tuesday, despite poor late game execution. Julius Randle scored 23 points, had 18 rebounds, and 6 assists. D’Angelo Russell had 23 points and 9 assists on another efficient shooting game as well. Jordan Clarkson’s basket gave the Lakers a 1 point lead with 2:21 to play. However, Waker’s 3-pointer put the Hornets back in front 100-98, about a half a minute later. With 1:07 left Marvin Williams hit another 3-pointer to make it 103-98 Charlotte. The Lakers never recovered. D’Angelo Russell made two late three pointers, but the Hornets made 6 straight free throws to get the win. The win was just the 3rd in the last 16 games for Charlotte, but also their 2nd in the last 3 games. The Lakers on the other hand lost their 5th straight game, and still have the third worst record in the NBA. Phoenix is just half a game behind them in the standings (for those of you interested in a tanking update). Once again, Timofey Mozgov and Luol Deng did not play for the Lakers. It was the 4h straight game Mozgov didn’t play, and the 1st for Deng, although he only played 13 minutes in the game against San Antonio. The Lakers are off until Friday. That night they’ll take on the Boston Celtics, for the only matchup at Staples Center this year between the two clubs. The Spurs issued the Lakers a good old fashioned beat down on Sunday afternoon at Staples Center, in a 119-98 win over LA. This game was like watching the old man at the YMCA school the young athletic kid that thinks he’s invincible. The Spurs took a 16 point lead behind 16 1st quarter points from Kawhi Leonard after 12 minutes of play. They also had 14 assists on 15 made field goals. Midway through the 2nd quarter, San Antonio already had 17 points off 10 Laker turnovers, and had built an 18 point lead. That lead ballooned to 61-41 by halftime. There were a few bright spots for LA despite getting manhandled. One of them was Kareem Abdul-Jabbar getting honored at halftime for his various work in social activism. On the floor, Brandon Ingram scored a career-high 22 points, while D’Angelo Russell and Jordan Clarkson were productive on offense as well. Russell scored 18 points, and Clarkson scored 19, with each of them shooting an efficient 50% from the field. Despite a better effort in the 2nd half from LA, the difference in the game was the Spurs efficiency at both ends of the floor. San Antonio had 49 baskets on 37 assists. The Spurs were led by Leonard’s 25 points, LaMarcus Aldridge scored 16, and Pau Gasol had 15. The loss was the 41st of the season for LA, and their 4th straight defeat. San Antonio on the other hand improved to 45-13, and 3-0 against the Lakers on the season. The Lakers continue their home stand on Tuesday night against Charlotte, when they’ll try to get back in the win column. Russell Westbrook was a human tornado as usual. Westbrook scored 17 points, 18 rebounds, and 17 assists, as the Thunder took down the Lakers 110-93. 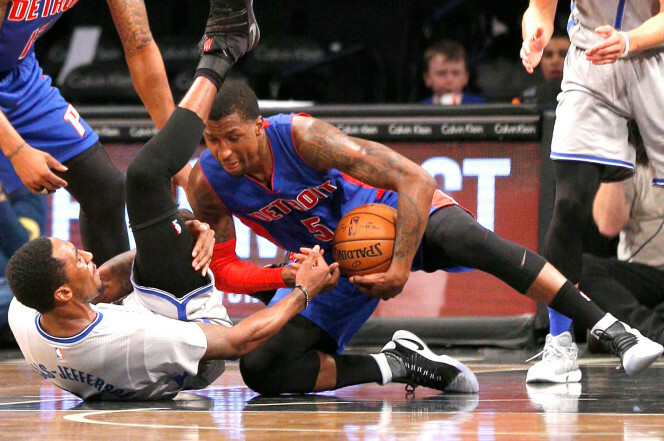 The game was also the first for two new Thunder players who were acquired on Thursday. Those players were Taj Gibson, who scored 12 points, and Doug McDermott, who scored 8. That was impressive in spite of the fact that neither was able to participate in the morning shoot around Friday. As for the Lakers, D’Angelo Russell scored 29 points, but the Lakers shot just 39.6% as a team. Russell picked up the scoring slack after the team’s leading scorer, Lou Williams, was traded a few days earlier. The Lakers acquired Corey Brewer from Houston, in the trade for Williams. Brewer scored 2 points in 4 minutes of playing time. Jordan Clarkson scored 14 points and Julius Randle had 13 points and 11 rebounds as well, but the Lakers shot just 7 for 35 on three-pointers. The Lakers trailed throughout. Oklahoma City led 58-51 at the half, and quickly opened up a 73-58 lead in the 3rd quarter. LA got within 9 points with just over 4 minutes left, but free throw shooting didn’t help their cause. The Lakers were just 6 of 14 from the free throw line. Lakers new President of Basketball Operations, Magic Johnson, made the trip to Oklahoma City in order to get a better feel for the team. D’Angelo Russell recognized the importance of this. Things won’t get any easier for the Lakers. They’ll take on the Spurs at Staples Center on Sunday. Nothing much is happening with the Lakers these days right? I guess just a complete change in leadership and a trade of their leading scorer on Tuesday. Other than that, nothing much. We knew it was coming, but just didn’t know when or how. It happened on Tuesday. Magic Johnson replaced Jim Buss as head of Basketball Operations, and fired Mitch Kupchak as General Manager. They also let go of long time publicist John Black. It was all orchestrated by Jeanie Buss, who didn’t hide behind Magic. The moves didn’t stop there. The Lakers acted swiftly, hiring NBA player agent, Rob Pelinka as their new General Manager. They also traded leading scorer Lou Williams to Houston for Corey Brewer and a 1st round pick in 2017. Let’s start with the leadership change. You have to give Magic credit. He has guts. He had a good relationship with Mitch Kupchak, yet concurred with Jeanie that it was time for a new vision. It was time to stop reaching into their past to try and fix the future. 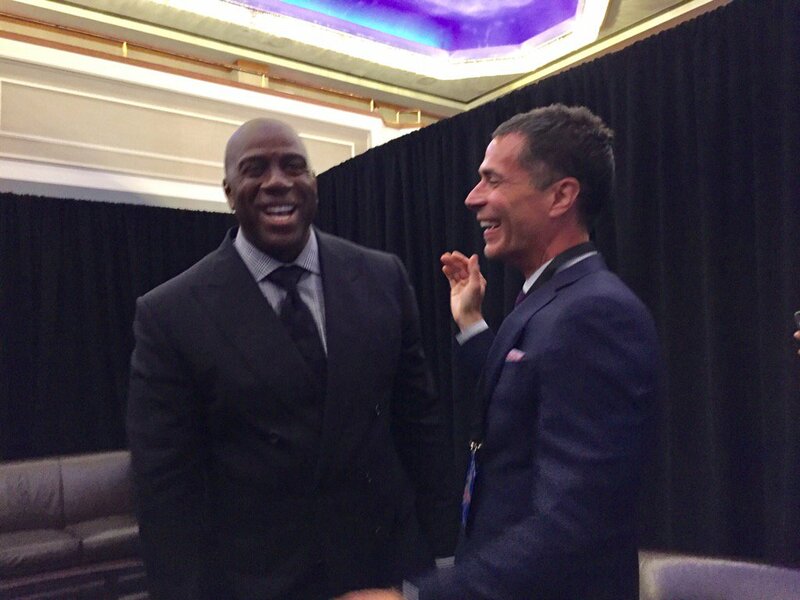 You all thought that’s what was going to happen with Magic, but he ended up making a completely out of the box hire in Rob Pelinka. I feel terrible for Kupchak. He has been part of the Lakers organization for the last 30 years, and spent the last 17 years as their General Manager. He also helped assemble the last five Laker Championship teams. He probably lost his job because Jim Buss proclaimed that the Lakers would be competitive within three years. That never happened. Kupchak has made some sensational trades over the last 15 years. Trading for Pau Gasol, finding gems like Trevor Ariza before anybody knew who he was, and signing Metta World Peace to a below market contract. He traded for Chris Paul and saved the Lakers $20 million along the way before the league vetoed it. Contrary to the nonsense you might hear, he’s draft well over the last three years too. However, his downfall was letting Dwight Howard and Pau Gasol walk away without compensation. Then there’s Jim Buss. Nobody really feels bad for Jimbo. Even though he gets removed from Basketball Operations, he still retains his piece of ownership of a franchise that is worth over $3 billion. Still, Buss isn’t the buffoon that most of you think he is. His basketball acumen is actually very good, but he let his ego get in the way. Most notably when he didn’t re-hire Phil Jackson as head coach in 2012, and instead went through a series of poor coaching choices: Mike Brown, Mike D’Antoni, and Byron Scott. He also naively believed that the top free agents of the last few years would just sign with the Lakers simply because of their history and location. Buss had the resources around him to succeed, but refused to leverage them because of his ego. The tension between Jim and Jeanie heightened after the Phil Jackson debacle, and has remained. The communication between Jeanie and the Basketball Operations department has only gotten worse. They never even told her about the Byron Scott hire a few years ago. Nor did they mention to Magic or Jeanie their recent attempts to acquire DeMarcus Cousins. No organization can succeed without communication between its top leaders, and a unified vision from them. The Lakers have that now with a new regime in the front office. On one hand, had the Lakers waited to hire a GM, they might have had a number of options from existing executives around the league, and some good ones. It’s also a little disappointing to know that Jerry West isn’t going to be coming back, even as an advisor. However, Rob Pelinka is a forward-thinking hire, who understands the complex new CBA. He has a number of relationships with players around the league. That’s going to help when it comes to free agency. Drafting and scouting is going to be critical however, so he’ll have to rely on what remains of the Laker front office for that. Nevertheless, you have to appreciate the decisiveness the Lakers acted with in hiring Pelinka, in the same forward thinking way they hired Luke Walton. In addition to all this chaos, Magic somehow kept things together and the team even managed to pull off a good trade today. Lou Williams needed to be traded, and the 1st round pick was much needed. I’m nit picking here, but I would have rather seen a much higher first round pick in this years draft from a team like Charlotte or Indiana. I would also have rather seen a few expiring contracts like KJ McDaniels and Nene Hilario come back in the trade instead of Corey Brewer, who is due $7 million next year. Still, the most important aspect of the trade is that the Lakers improved their chances of keeping their top 3 protected pick, and opened up more playing time for D’Angelo Russell and Jordan Clarkson. Hopefully the Lakers aren’t done yet and can find a way to trade Nick Young as well before Thursdays trade deadline. Either way, the Lakers new leadership is bold and exciting. Let’s just hope it brings them back where they belong. Well that went badly. The Lakers skidded into the All-Star break, losing to the Suns 137-101 on Wednesday night in Phoenix. Eric Bledsoe led the way for the Suns with his third career triple double, and Devin Booker added 23 points of his own. Bledsoe finished with 25 points, 13 assists, and 10 rebounds, as the Suns set season highs in points and in field goal percentage, shooting 55% from the floor. Bledsoe hit a half court shot at the buzzer at the end of the 1st half. It was also the Suns 11th straight victory at home against LA. The Lakers got 21 points each from D’Angelo Russell and Lou Williams, but nothing else went right for them. They lacked energy from start to finish, they shot 37% from the field, and they were crushed on the glass by a margin of 59-36. LA heads into the All-Star break losing 3 of it’s last 4. The only good news is that they moved closer to the Suns in the standings, with the Lakers only a half game in front of the Suns in the Western Conference. Phoenix has the second worst record in the NBA, and the Lakers 1st round pick in 2017 is top 3 protected, so finishing in the bottom 3 wouldn’t hurt. The Lakers next game isn’t until February 24th, one day after the NBA’s trade deadline. The leads to the question of whether or not Lou Williams and/or Nick Young have played their last game with LA. Both veteran guards are generating interest around the league, and one General Manager even confirmed to Basketball Insiders’ Alex Kennedy that the Lakers have been discussing Williams in trade talks. Lakers GM Mitch Kupchak also confirmed that there has been a lot more activity lately. “We are active, yes. We’re active every year. … Quite frankly compared to the last three or four years, we have a lot of talent on this roster that I think a lot of people have interest in — varying levels of interest. I would think there’s more meaningful discussions this year than there have been the last two or three years,” Kupchak said. Whether that activity leads to any trades remains to be seen. However, the Lakers would benefit a great deal from moving veteran players from their roster, especially if it means adding future 1st round picks, and opening up more playing time for their young players to develop. Lou Williams led a fierce fourth quarter rally, but the Lakers came up short against the Kings at Staples Center on Tuesday night, losing 97-96. Williams scored 19 of his 29 points in the 4th, including two game-tying baskets in the final two minutes. However, DeMarcus Cousins had 40 points and 12 rebounds, including the Kings final 10 points. Cousins made 1 of 2 free throws with 9 seconds left in the game, after being fouled by Larry Nance Jr. That put the Kings up by 1 point. Williams attempted a potential game-winning three, which sailed wide right of the basket at the buzzer. The Lakers outscored the Kings 18-10 in the paint and 12-0 on fast-break points in the 4th quarter. LA was trailing 70-64 after three quarters. They got as close as two at one point in the 3rd, but Sacramento went on a 9-0 run to extend the lead to 11 points. Other than Williams, Julius Randle and Nick Young were the only Lakers in double figures. Young scored 10 points and Randle had 11. However, Randle and D’Angelo Russell didn’t play in the 4th quarter. “They earn that chance”, said Lakers coach Luke Walton. Walton also felt like he had to ride the hot hand with Williams. “When Lou is having the type of game he was having, we weren’t gonna take him out,” he explained. The Lakers have lost 4 of their last 6 games, and have just 1 game left tonight before the All-Star break. The Lakers will be visiting the Phoenix Suns, in a game that is critical for both teams potential draft lottery positioning. What Is Magic Really Saying? Magic is back with the Lakers, but only Jeanie Buss really knows what’s going to happen. However, since Magic has been named an advisor, he’s been making noise by telling the media that he wants to be the one “calling the shots”. Since he was named an advisor, all I’ve heard are the Colin Cowherd’s of the world criticize the Lakers for being unable to turn the page from the past, and that it would be silly to let Magic be the one in charge of the Lakers Basketball Operations Department. For those people that think that, you are missing the point. 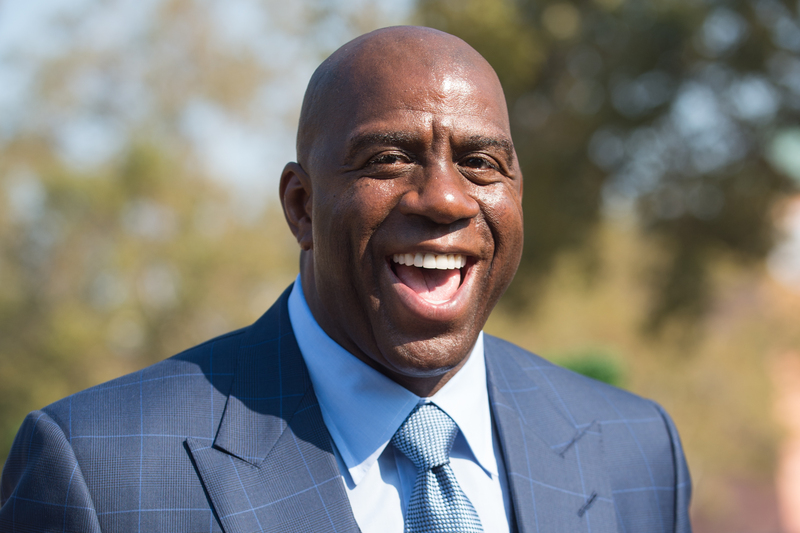 Magic Johnson has made nearly half a billion dollars since retiring from the NBA. He’s one of the most successful business men in the country. The man currently has too many successful businesses to count, yet it feels like he jumps from one business to the other in a very short amount of time. How is this possible? The answer is that he knows how to delegate, and how to surround himself with smart people that will make him successful. That’s why his businesses continue to run while he moves on to his next venture. When Magic Johnson says he hopes he will be “calling the shots” with the Lakers Basketball Operations Department, most of you are envisioning that he’s going to be the teams’ Scout, General Manager, and Capologist all in one. That’s not the case. All Magic is saying is that just like with his businesses, he wants to have the final say. He’s smart enough to know that only by adding more smart people in the room, he will make these smarter final decisions. Some of the smartest executives in the NBA (R.C. Buford, Travis Schlenk, Masai Ujiri, etc) are guys you’ve never heard of. However, if Magic is put in charge, his success will be determined by whether or not he can pluck those kinds of executives from other teams. Based on his track record of success, it seems like a pretty good bet he can pull something like this off. That’s not to say that Mitch Kupchak and Jim Buss won’t be with the Lakers anymore. They’ve done enough to prove their worth. They might just need more help given the challenges of the new collective bargaining agreement. Just don’t doubt Magic Johnson. The man knows his strengths and his limitations. That self-awareness is actually what really makes everything he works on a success. That’s exactly why Jeanie Buss brought him back into the picture. The Lakers started fast and held on in Milwaukee on Friday for a 122-114 win over the Bucks. Nick Young scored 26 points while Lou Williams poured in 21 off the bench, to overcome a career-high from Bucks All-Star forward Giannis Antetokounmpo. Antetokounmpo scored 41 points but it wasn’t enough, as the Bucks played their first game without Jabari Parker since losing him to a torn ACL. LA scored 47 points in the 1st quarter, which was the most by any team in the league this season. They led 76-55 at the half, setting their season high in points in any half this season, while shooting a blazing 69% from the field. The Lakers led by as many 27 points, and 19 going into the 4th quarter, but the Bucks wouldn’t go away. Greg Monroe’s layup with a minute left brought Milwaukee within 5 points, but they would get no closer. LA knocked down 8 straight free throws to put the game away. It was their 2nd victory in the last 3 games. The win wraps up a 5 game trip for LA, in which they went 2-3. It also comes just one day after Coach Luke Walton put the team through one of their toughest practices of the season. That practice was filled with tons of running, which was unusual for the team at the end of a long trip. With seven players in double figures and 25 assists, it looks like they benefitted from it. The Lakers return home to play Sacramento on Tuesday night, followed by a trip to Phoenix for their last game before the All-Star break. LA is now 19-37, which is already two more wins than the team had all of last season. And some of you thought the Lakers wouldn’t be better.